I love sandwiches, but eat them very rarely, I'm unsure why. My favorite is a pb&j, boring. But I also love BLTs and turkey reubens! I need to try that wasabi mayonnaise, I have heard so many good things about it and I LOVE wasabi! LOVE sandwiches!!!! It would be a sad, sad world w/o them! I just had a neat combo yesterday: avocado, tomato and baby arugula on whole wheat pane. Yum! Bet some cheese would've been good on it, too! I love sandwiches! They are perfect for the weather we are having today. I love grilled/pressed cheese with pesto and tomato. Avocado is also a yummy addition. Big fan of sandwiches and really like the version you posted-- sounds great! That looks SO delicious! I had been craving turkey and avocado on whole wheat so I had a half of one yesterday w/ TJ's Cream of Tomato soup for lunch. It hit the spot! Nice. Mmmm...i want one of those sandwiches right now. It actually lunch time. Perfect timing, eh? Oooooey Gooooooey just about covers it! that and your wasabi mayo is one of my FAV ing!!! Your sandwich looks delicious. I've been into wraps lately so I forget what my last sandwich was. BLT maybe? I love sandwiches! But cheese scares me...it's one of those fear foods. wow, that looks like it tasted phenomenal! bread is one of my fave foods so yes i <3 sandwiches. turkey avocado with sprouts is the best! wasabi mayo...is it really spicy? I loved reading all your favorite sandwich combos! Many ideas... :) Thanks!!! Oh yum!! That looks soooo good! 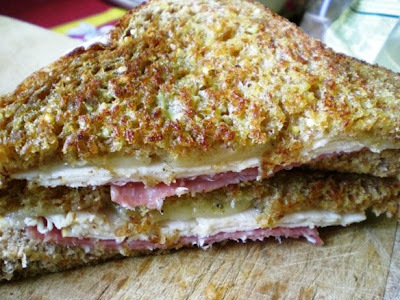 I love sandwiches, don't have them very often, but will make them 'egg dipped' with spices & cheese.. yum! 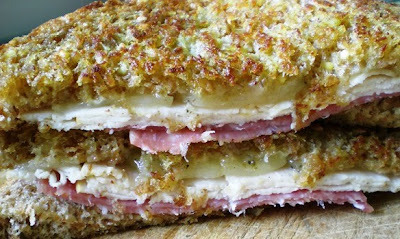 OK now I seriously have sandwiches on the brain! My fav toasted cheese sandwich is a tie between toasted cheese and pickle and toasted cheese and tomato. Love love love a veggie sub on a sesame roll with mayo, provolone cheese, lettuce, tomato, onio and banana peppers. YumME!